Moixa, the UK’s leading smart battery company, today announced a strategic partnership with one of Japan’s largest trading houses, ITOCHU Corporation, to market its GridShare platform, which manages and optimises home energy storage systems. The agreement enables Moixa to launch GridShare in the rapidly growing Japanese battery market. Itochu, which is ranked 215th in the Fortune 500, will also help fund international expansion by investing £5 million in Moixa, adding to its investments in leading British companies such as Paul Smith and Kwik Fit. Itochu will have sold over 6,000 units of “Smart Star” home battery systems through its distribution network in Japan by the end of March 2018 and will install GridShare as standard on products by the summer of 2018. The technology will save customers money by using artificial intelligence to optimise the performance of their battery based on their patterns of behaviour, the weather conditions and market prices. Japan had over 125,000 energy storage systems in 2016 , which Moixa and Itochu forecast will exceed 500,000 in 2020, and also has the world’s third largest fleet of electric vehicles . 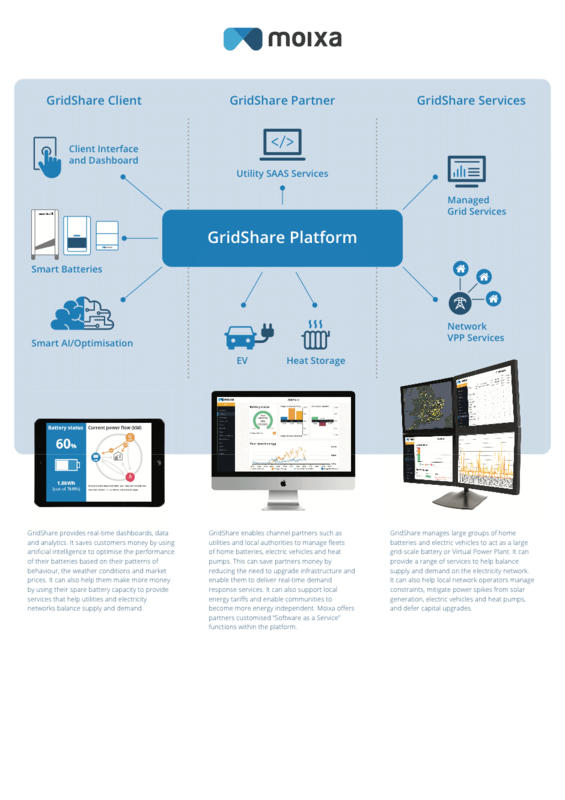 GridShare optimises the performance of batteries and can also manage large fleets of devices to help support solar generation, control vehicle charging and deliver services to the electricity grid. The Itochu partnership further strengthens Moixa’s relationships in the country, following investment last year from the country’s largest utility, Tokyo Electric Power Company (TEPCO), and a partnership with Hitachi to develop a smart energy grid in the Isles of Scilly. Simon Daniel, CEO of Moixa, said: “Itochu is a major player in the global battery market and this partnership provides a real opportunity for us to expand our business in Japan and provide GridShare technology to many global battery companies. Moixa has excellent support from its partners to expand internationally. It has raised £500,000 from existing shareholders alongside the £5 million from Itochu. This follows £2 million raised in 2017 plus a £1 million funding facility from the Greater Manchester Combined Authority. Moixa will now seek to expand its GridShare partnerships with Japanese utilities and electric vehicle manufacturers and to market services to electricity networks. It is also planning trials in the US and Europe this year. Many Japanese solar manufacturers are marketing home batteries, with attractive consumer credit packages available. They not only allow consumers to use more of the energy they generate but also provide back-up power in a country prone to earthquakes and typhoons. GridShare now offers consumers extra saving opportunities, helping to compensate for feed-in-tariffs which are only available for 10 years and will begin to expire from 2019. Battery aggregation is also attractive to utilities such as TEPCO to help manage solar growth and support smart tariffs, by using intelligent storage management to even out peaks and troughs in demand for power. It also offers an opportunity to make the electricity grid more resilient to disruption from earthquakes. Moixa is the British leader in smart battery technology. It has installed nearly 1,000 systems in the UK, and it has pioneered software to optimise the performance of each battery, and to aggregate multiple distributed batteries to create virtual power plants. The company holds patents in the UK, US and Australia on distributed smart battery systems, and aggregating batteries for grid services. Artificial intelligence and optimisation algorithms are being increasingly used in the energy system to detect and identify savings opportunities. Google, for example, has achieved 15% energy savings in its data centres. GridShare is currently delivering services across the UK for contracts supported by major utilities, network operators and public bodies such as the European Regional Development Fund, the Department for Business Energy and Industrial Strategy, the Department for Energy and Climate Change and Innovate UK. Moixa has an unrivalled track record in the UK home battery market, with over 10 years of research and development, strong international patents and proven technology. It has installed Moixa Smart batteries in 1000 homes nationwide with a combined capacity of over 2MWh and nine million hours of use. It has worked with councils and housing associations, energy utilities and network operators to deliver more than £6 million of projects. It has received over £5 million in grants and pilot awards in addition to equity investments. The Moixa Smart Battery is a compact (50cm x 30cm x 20cm), cost-effective, wall-mounted unit that fits easily into homes and is easily installed. It is an all-in-one Lithium Ion Phosphate battery system, requiring no additional equipment, and AC-coupled, so it can take advantage of smart tariffs by importing electricity from the grid when it is cheap, and provide options for back-up power. It has a 20-year lifespan and comes with an extendable ten-year guarantee. Moixa smart grid patents are cited by hundreds of international companies and include US2010076615, US9379545, US8849471, GB2476213, US20140159584, GB2510804, GB2539317, AU2013353807. ITOCHU, based in Japan, is one of the leading general trading companies. ITOCHU engages in domestic trading, import/export, and overseas trading of various products such as textile, machinery, metals, minerals, energy, chemicals, food, general products, realty, information and communications technology, and finance, as well as business investment in Japan and overseas. ITOCHU was originally founded in 1858, and has approximately 120 bases in 63 countries, and with revenues of $44bn ($1=JPY110) at the fiscal year end March 31, 2017. Itochu has also invested in a number of internationally recognised brands, including Hunting World, LeSportsac and Mila Schon, and trademark rights for Converse in Japan. It invested in Paul Smith Group Holdings Limited, in 2006 based on a longtime license relationship, and invested in Kwik-Fit, the UK automotive specialist in 2011.
 http://www.hybridcars.com/the-world-just-bought-its-two-millionth-plug-in-car/ – Japan has the world’s third largest fleet of electric vehicles with more than 147,000 on the road at the end of 2016.